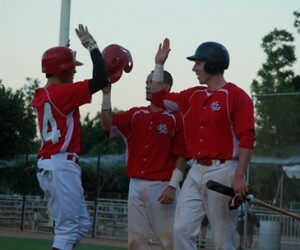 PALM SPRINGS, CA – The Palm Springs POWER took game one of the Southern California Collegiate Baseball League Championship Series Tuesday night at Palm Springs Stadium, winning by a score of 6-1. Nick Baker (SO, California State University, Chico) took the mound for the tenth time this season for Palm Springs, looking for his tenth victory. The Athletics struck first, scoring in the first half inning of the contest on back-to-back hits, as a Christian Ramirez double scored leadoff hitter Greg Hamrock to make it 1-0. The POWER struck back quickly. After getting shut down three up, three down in the first, the home team put together two singles to cover the corners. Ryan Garvey (FR, University of Southern California) then crushed a pitch from Athletics’ starter Jacob Valenzuela to deep right field for a three-run opposite field home run, making the score 3-1 POWER and giving them a lead that they would not give up. The POWER scored six straight runs. They scored another in the third, this time on an RBI single from POWER co-captain Marcus Romero (SR, Southern Utah University). In the fourth, an RBI triple from Garvey and a sacrifice fly from Zack Haley (SR, Liberty University) made the score 6-1. Garvey finished 2-for-3 with the homer and triple, scoring twice, and knocking in four RBIs. Nick Baker allowed a baserunner in every inning except the second, but worked out of jams all night. The Palm Desert High School graduate didn’t allow a run after the first and stranded six So Cal baserunners. His eight strong innings earned him his franchise record tenth win. Tony Guerra (JR, California State University, San Bernardino) came in to close out the ninth, putting up a perfect frame, including one strikeout. The POWER are now just a win away from their third SCCBL crown. The players are happy with the win but hardly content: “It’s always good to get the first one, but the job isn’t done,” said POWER co-captian Chett Zeise (SR, University of Iowa). “We have to keep playing the way we have been all summer. Tomorrow is a new day, and the Athletics are a good team. We have to come out ready to play. We still have one more big one to get,” he added. Romero had two hits in the ballgame, continuing his solid play every night out for the POWER. While cautious, he is definitely confident: “Their backs are against the wall. We will go into tomorrow with the same mentality as today and hopefully bring the trophy back to Palm Springs,” said the other co-captain, Marcus Romero. The victory was the POWER’s 39th of the season, tying a franchise record from 2006. So Cal will host Game Two at Rio Hondo Community College in Whittier, CA on Wednesday, July 27 at 2:05 p.m. 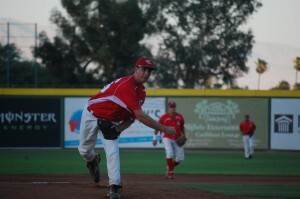 The lefthander James Crockett (Grad., Southern Utah University) will get the nod for the POWER. The Athletics starting pitcher has not been disclosed. The POWER will host Game Three, if necessary, on Thursday at 7:05 p.m. Game Three will be $1 Beer Nights at Palm Springs Stadium; all Bud and Bud Light draft beers will cost just a buck. All POWER games can be heard live on www.PSPBB.com. Game Three, if played, will also air locally on NewsTalk 920 KPSI Palm Springs.